news from day to day, even from hour to hour. 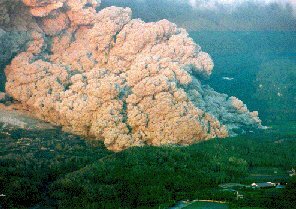 Some times I even put news about an eruption out on the net before everyone else. just two or three minutes later. USGS used the same picture next day on their pages. 'Volcanoes of the World', by Tom Simkin & Lee Siebert, Smithsonian Institution, 2nd edition. of print, several years ago. and I wish to apologize for where I have mislead their understanding. those two islands are to be counted as only one each, with many vents and comtemporary such. 'new' names, Tenerife and Lanzarote. times we have also seen traces of ash, and then we have one. there is an eruption or not, because it doesn't say anything about ash or other volcanic material. it is what happens later. More about this on our new page: "Are Volcanoes really dangerous?" my new knowledge in what is coming up next on my pages about volcanoes and volcanism. Your comments are always most appreciated, and will listen to whatever you have to say.